Like most artists I know, I always have many projects on the go at the same time. As I move between them: from a project in rehearsal to a project in a first-draft reading to a project in a dream phase to another in research mode, I try to keep them separate. Inevitably, however, an idea or a line or a character will pop from one play into another, creating this strange sort of discourse between pieces which have nothing in common aside from the fact that I’m writing them simultaneously. I’m not sure whether I should resist this phenomenon or lean into it. I’ve spent a lot of time with theatre students lately. At John Abbott College, Bishop’s University and The National Theatre School. I’ve been struck by their curiosity, intelligence and challenging questions, some of which I truly struggle to answer with the same level of curiosity and intelligence. They are thinking deeply about how we treat one another, respect one another, deal with our past and make art. I think we’re going to be fine. flames leapt from the City of Light. – Notre Dame’s on fire, I told my daughters. – No. No, I don’t think so, I said and felt a moment of relief. It’s then I thought of the Hunchback. The most challenging thing in my life is learning and living in French. Every day is a risk to speak, to be understood, to connect, to try to find subtlety where I don’t have the words. Here are some things I have done in French: a theatre Q&A, a presentation on playwrighting to a grade one class, made dentist appointments, signed up for swimming classes, looked for books on traditional Chinese costumes at my local bibliothèque, had many many cinq à septs with my neighbours. My vulnerability is always rewarded with generosity. And that feels really good. I haven’t lived in Toronto for five years now. When I return, I notice the shifts in the urban landscape. On my walk from Factory to Tarragon today I saw the Honest Ed’s demolition site. In the middle of it all were two attached, three story buildings. These once-homes, once-shops stood bare and vulnerable in the rubble of the past. Alone, but for one another, they stand in defiance of a future that would have them submit to destruction. Do they feel pressured to crumble? Or bold in their resistance? A play is a wish, a hope, a longing; a series of thought experiments and arguments; surges of emotion and frustration, pain and longing, fear and desire; coordinated whispers and secrets and touches; and deep, purposeful spaces of unknowing. Until … the first day of rehearsal. Looking forward to another beginning. Tomorrow. I’ve been thinking a lot about the ceaseless battle over women’s bodies and the seemingly insatiable desire to control or legislate what women should or should not be wearing. There’s Premier Legualt’s imminent ban on “religious symbols” for public sector employees in Quebec, which is a thinly veiled attack on the freedom of Muslim women. Then there’s unhealthy capitalism which has coopted female beauty and transformed it into something which must be constantly doubted and perpetually augmented. This has led to the internalization of ugliness, low self-worth, and a thriving beauty-product industry. I mean, come on, give it rest. 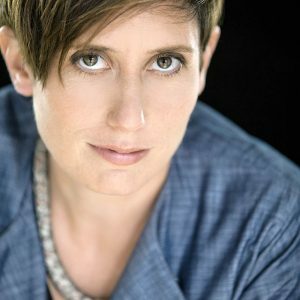 Erin Shields is a Montreal based playwright. Her most recent play, Paradise Lost, premiered at The Stratford Festival this summer and was published by Playwrights Canada Press. It won the Quebec Writers Federation Prize for Playwriting was nominated for a Governor General’s Literary Award. Erin won the 2011 Governor General's Award for her play If We Were Birds, which premiered at Tarragon Theatre. Other theatre credits include: The Lady from the Sea (The Shaw Festival), The Millennial Malcontent and Soliciting Temptation (Tarragon Theatre), The Angel and the Sparrow (The Segal Centre), Beautiful Man and Montparnasse (Groundwater Productions), Instant (Geordie Productions, DORA for Outstanding TYA Production, META for Outstanding New Text), Mistatim (Red Sky Performance), and Unit B1717 (Théâtre á Corps Perdus). Upcoming productions: Beautiful Man at Factory Theatre May, 2019; Piaf/Dietrich at Mirvish Productions, September-December, 2019; Paradise Lost at The National Arts Centre, April/May 2020.